Vortex Genie the Most Popular Mixer Across North American Laboratories – Why? Investing in a quality laboratory vortex mixer is something that will ensure the proper mixing of your solutions and increase the accuracy of your experiments. At Pipette.com, our Vortex Genie mixers are some of our most popular products thanks to their simple design and affordable price. They also offer a level of quality not found in any other products within their price range, making them one of the most often-used mixers in laboratories. 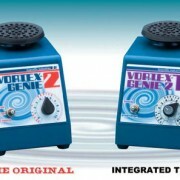 The flexibility of the Vortex Genie series allows them to be used with all kinds of equipment including beakers, tubes, flasks, and more…features make the Vortex Genie adaptable to many different kinds of needs and uses, which is why they are so sought-after for laboratories. The flexibility of the Vortex Genie series allows them to be used with all kinds of equipment including beakers, tubes, flasks, and more. Furthermore, they can be used in cold rooms as well as incubators and offer mixing speeds that range from gentle shaking to aggressive vortexing. All of these features make the Vortex Genie adaptable to many different kinds of needs and uses, which is why they are so sought-after for laboratories. The addition of the metal housing platform present in all of the Genie lines offers an added level of stability that will ensure that your mixer always stays in place. This level of reliability is why Vortex products are so trusted, as laboratories can be sure that poor or unreliable mixing will not hinder their experimental results. Of all of the Genie lines, the Vortex Genie 2 is the most popular thanks to its ability to control the speed and time of your mixing. Furthermore, it can stir multiple vessels simultaneously without compromising the quality of the final mixture and offers a varied speed range of 600 rpm to 3200 rpm. Despite its lower level of popularity, the Vortex Genie 1 is still a very effective mixer and offers a more violent vortex action that makes it perfect for experiments that require the highest level of mixing efficiency possible. It’s also compatible with a variety of tubes and can be used with a 3-inch platform if needed. With years of proven performance, the Vortex Genie is a mixer that you can trust to support positive experimental results. At Pipette.com, we ship all of our products within a 24-hour time period if they are in stock, meaning you can get your quality mixer as soon as possible. Don’t delay – place an order for the most popular vortex mixer on the market today! https://solutions.pipette.com/wp-content/uploads/vortex-genie-mixers-1-2-digital.jpg 297 940 Scott https://solutions.pipette.com/wp-content/uploads/pipettecom-logo.png Scott2015-06-12 12:05:322015-09-16 09:32:32Vortex Genie the Most Popular Mixer Across North American Laboratories – Why?